Property Size 1,501 sq. ft. Spend your vacation in this bright, colorful and fun vacation home. The pool area is perfect to relax while spending some quality time with family and friends. This lovely house is the ideal vacation home, where you will create memories of a lifetime. The Silk house will accommodate up to 6 people, it has 3 bedrooms and 3 bathrooms. The fully equipped kitchen has granite countertops, stainless steel appliances and breakfast area with bar stool. The dinning area which seats 6 is located next to the kitchen and close to the living room. The community is located only a few minutes from Walt Disney World. Accommodates up to 6 Guests with 3 Bedrooms and 3 bathrooms. Nestled on 20 acres of pristine Florida nature, The Retreat offers residents an escape from the everyday. 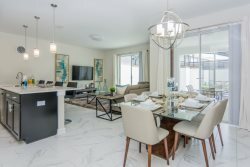 The Retreat is part of the Dream resort, an eco-friendly resort style community located in the heart of the vacation capital of the world, the Four Corners region of greater Orlando, Florida. The Retreat offers 88 Eco-Friendly vacation homes complete with calming views and distinctive features throughout. A secluded natural setting adds a special ambience to these 21st century properties all within minutes of major Orlando attractions. Each one shares The Retreat ECO-CLUB.